Town in Galilee, situated in a valley to the north of the plain of Esdraelon. It is about 1,200 feet above the level of the Mediterranean. Nazareth first appears in the New Testament as the place where Jesus passed his boyhood (Matt. ii. 23; Luke i. 26; ii. 4, 39, 51; John i. 46 et seq. ; Acts x. 38). It is not mentioned in the Old Testament, or in Josephus or the Talmud (though Eleazar Ḳalir [8th and 9th cent.] in the elegy "Ekah Yashebah" mentions the priestly class of Nazareth [ = "Mishmeret"], doubtless on the basis of some ancient authority). This has led Wellhausen ("Israelitische und Jüdische Gesch." p. 220) and Cheyne (Cheyne and Black, "Encyc. Bibl.") to conjecture that "Nazareth" is a name for Galilee. Such an inference is in the highest degree precarious. It is evident from John i. 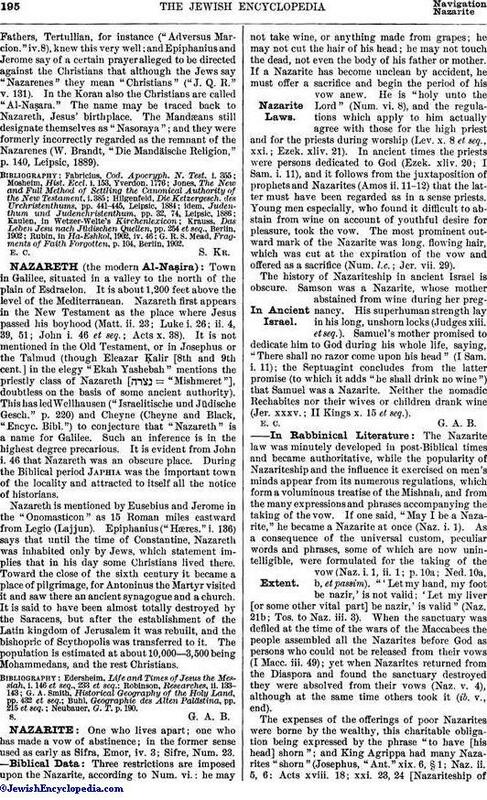 46 that Nazareth was an obscure place. During the Biblical period Japhia was the important town of the locality and attracted to itself all the notice of historians. Nazareth is mentioned by Eusebius and Jerome in the "Onomasticon" as 15 Roman miles eastward from Legio (Lajjun). Epiphanius ("Hæres." i. 136) says that until the time of Constantine, Nazareth was inhabited only by Jews, which statement implies that in his day some Christians lived there. Toward the close of the sixth century it became a place of pilgrimage, for Antoninus the Martyr visited it and saw there an ancient synagogue and a church. It is said to have been almost totally destroyed by the Saracens, but after the establishment of the Latin kingdom of Jerusalem it was rebuilt, and the bishopric of Scythopolis was transferred to it. The population is estimated at about 10,000—3,500 being Mohammedans, and the rest Christians. Neubauer, G. T. p. 190.